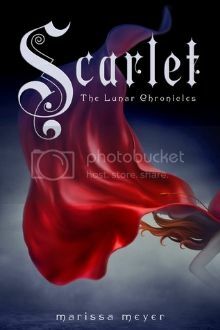 Note: Scarlet is the second book in the Lunar Chronicles, and the following summary may contain spoilers. To read my review of the first book, Cinder, click here. Goodreads Summary: Cinder returns in the second thrilling installment of the New York Times-bestselling Lunar Chronicles. She’s trying to break out of prison—even though if she succeeds, she’ll be the Commonwealth’s most wanted fugitive. Last year, I was hesitant to read Cinder, but it surprised me in a good way. I loved seeing how the old fairy tale of Cinderella was transformed into a futuristic world of cyborgs and androids, powerful world leaders and a new evil queen. I've been excited for a long time to read Scarlet, and the book didn't disappoint. In Cinder, Marissa Meyer took the basic outline of the fairy tale but fleshed it out with new details and characters. In Scarlet, she does the same. The story of Red Riding Hood is there, but once again this book is so much more than its inspiration. Scarlet was strong and determined, loyal and dedicated to her grandmother and the farm. But in her narrative, Wolf stole the show. He was intriguing from the beginning, shy yet strong, fierce yet lacking confidence. Even though I knew I shouldn't trust him, I couldn't keep from softening to him right along with Scarlet. I was also glad to see that Cinder's story continued here. She's trying to figure out her new life, but fortunately she has help - Captain Carswell Thorne. Thorne's larger-than-life ego really brought out Cinder's snarky side, which made for great comic relief. Another relief - Thorne is never portrayed as a love interest. The one person I really missed in this book was Kai. Although we see him briefly, it wasn't nearly enough for the prince. One of the things I loved in Cinder and again in Scarlet is how many layers there are to the story. There are surprises, even if they aren't completely shocking, and the books are never dull. Even with hard-to-imagine sci-fi elements, the stories really come to life and the pages fly by. The world Marissa Meyer created is fascinating. I loved how the stories of Cinder and Scarlet intersected, and I can't wait to see what happens next for all of these characters. If you like fairytale retellings, sci-fi books, or just a great story, Cinder and Scarlet are definitely books you want to pick up. I'm already eagerly awaiting the next Lunar Chonicles book, Cress!